In parts of the world where monsters are common, a sharp sword and sturdy shield are a far more effective means of communication than words. Combat is a common part of the game, and it runs quite a bit differently than exploration. Instead of everyone acting whenever they want, you take turns, and there are rules for what you can and can’t do on your turn. This section of the book describes combat, including how to attack, cast spells, and move during combat. Combat in the game occurs whenever two or more creatures decide to attack one another using weapons, claws, spells, or other abilities. When this happens, everyone makes an initiative check to see who goes first, second, and so on. Time in combat is measured in rounds. Each round is 6 seconds long—enough time to move a bit and either swing a weapon or cast a spell. Ten rounds is 1 minute (60 seconds) of game time. The Game Master counts down from the highest initiative roll to the lowest, and when your initiative is called it is your turn. On your turn you get to take all of your actions, and when you’re done the GM counts down to the next creature. Once everyone has had a turn, a new round starts and the GM starts the countdown again. This repeats until the combat is over—usually when all creatures on one side have died, run away, or surrendered. When combat starts, it is helpful to use a map of the area with a square grid, such as the laminated Flip-Mat included in the box (you can use the blank side with the grid to draw your own maps with a dry-erase or wet-erase marker). The grid is measured in 5-foot squares, so you can use the grid to count out distance. For example, 30 feet is 6 squares on the map (30 divided by 5 = 6). A dwarf, elf, or human takes up exactly 1 square—not that the character is completely filling that square, but it represents the physical space of the character and how much area they can control, sort of like their “personal space.” Most monsters take up only one square, just like a human. 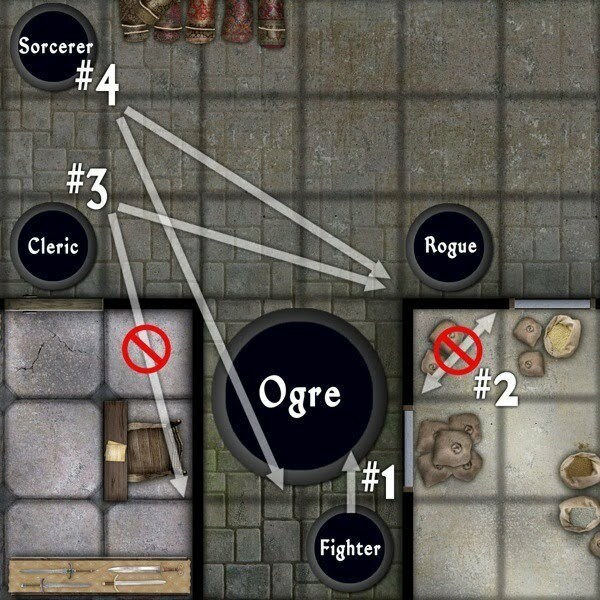 Some larger ones (such as ogres) take up 4 squares (a 10-ft.-by-10-ft. area). You don’t have to keep track of what direction you’re facing or looking—assume that a typical adventurer or monster is always expecting danger and is constantly looking around for trouble, especially in the middle of combat! A creature can attack an enemy in any adjacent square. Some monsters have the ability to reach more than one square away; the Game Master has information on how this works. The Pathfinder RPG Beginner Box includes dozens of cardboard pawns you can use to represent characters and monsters in a combat encounter. Having these pawns on a combat grid helps keep track of where your character is, how far your character can reach, which monsters are still alive, how far you can move on your turn, and so on. Combat encounters can get very tactical, and knowing what square you’re in can be very important. Choose a pawn that resembles your idea of what your character looks like (if you can’t find one that matches what you look like, you can use any pawn as a generic marker for your character). At the start of a battle, each combatant makes an initiative check. An initiative check is a Dexterity check: Initiative = 1d20 + DEX Mod If you have the Improved Initiative feat, you get a +4 bonus on the roll (this is already on your character sheet). The GM writes all of the initiatives in order on a piece of scratch paper, from highest to lowest. If there is a tie, all creatures in the tie should roll 1d20 to determine which goes first. Your initiative check doesn’t change during the combat, even if you don’t take an action on your turn or you fall unconscious. Initiative is like a clock—when you get to the lowest initiative number, it loops back to the highest number and starts all over again, and the creature with the highest initiative goes first. Sometimes combat begins with one side being surprised by the other—you surprised the monsters or the monsters surprised you. This usually happens with an ambush, or when one group sneaks up on the other group. When this happens, the GM has each sneaky creature make a Stealth check and the other group makes Perception checks to notice the sneaky creatures (this is an Opposed skill check). Anyone who fails the Perception check is surprised for the first round, which is called the “surprise round.” If anyone is surprised in a combat, two special things happen in the surprise round. One, anyone who is surprised can’t take any actions. Two, anyone who isn’t surprised can take only one action (a standard action or a move action). Once the first round is over, nobody is surprised, and everyone can take actions. If nobody is surprised at the start of combat, there is no surprise round and everyone takes turns normally. 3 GM puts everyone in initiative order. 4 In initiative order, everyone takes a turn. Surprised creatures can’t take actions on the first round. 5 End of round. Go to step 4. When going through the initiative order, each creature gets a turn. On your turn, you can take one or more actions. There are three kinds of actions. A free action takes almost no time to accomplish or can be done during other actions. As a free action you can talk, drop a held item, fall prone (flat on the ground), and so on. A move action takes up a small amount of time in a turn. As a move action you can move up to your speed, draw a weapon, pick up an item from the ground, stand up from prone, get on or off a horse, buckle on a shield, and so on. A standard action takes up most of your turn. As a standard action you can make a melee attack or a ranged attack, cast a spell, activate a magic item, or use a class feature like channel energy. You can also use a standard action to take a move action, even if you used your move action. You can take one action of each type on your turn. For example, you could drop your crossbow as a free action, draw your sword as a move action, and attack a goblin as a standard action. You don’t have to take all three types of actions on your turn. For example, if you were already holding your sword, you could just attack the goblin with your standard action and not use your move action or free action. You can take your actions in any order—attacking and then moving away or moving to an enemy then attacking are both allowed. You can’t “save up” actions from one turn to use them on your next turn. Sometimes (like in a surprise round) you won’t be able to use all of your actions in a turn. Some slow or complex things require you to spend a “full-round action” to do them, like lifting a heavy gate or disabling a trap. When you spend a full-round action, you use your standard action and your move action for that turn, but you can still take your free action. More info on the three kinds of actions is next. Free actions take hardly any time at all. You can usually only do one free action each turn, though the GM may allow you to do more than one on your turn. For example, you could shout a warning to a friend and drop your crossbow at the same time. Some skills, feats, and spells may let you do other types of free actions. You can drop an item you’re holding into your square or an adjacent square. You can drop prone in your square. You can move 5 feet (one square) in any direction, but only if you don’t use your move action or standard action to move (in other words, you can’t use this to get another 5 feet of movement on your turn). If you take this action, it is the only movement you can do this round. You cannot take a 5-foot step if your movement is slowed or you are moving into terrain that slows you down (like mud or bushes). In general, speaking is a free action. Speaking more than a few sentences is generally beyond the limit of a free action—after all, a round is only six seconds, so you can’t talk more than that long on your turn. Sometimes you have to talk as part of using a skill (like Diplomacy) or casting a spell, but that’s included in the action for using the skill. You can move through an ally’s square, but you can’t end your movement there. You can’t move through or end your movement in an enemy’s square. If a creature is helpless (unconscious, paralyzed, and so on) you can move through or end your turn in its square, whether it is an ally or an enemy. You can move diagonally on a square grid. The first diagonal counts as 5 feet, the second counts as 10 feet, the third as 5 feet, the fourth as 10 feet, and so on. You can’t move diagonally around a corner or through a doorway (you have to move straight one square, then to the side one square). You can move diagonally past a creature. You can move diagonally past other obstacles such as pits. Difficult terrain is something that slows down your movement, such as heavy undergrowth, broken ground, or steep stairs. Each square of difficult terrain counts as 10 feet (2 squares) of movement. Every diagonal move into a difficult terrain square counts as 15 feet (3 squares) of movement. If you are flying, difficult terrain doesn’t slow you down. Rarely, you may accidentally end your movement in a space where you’re not allowed to stop. When that happens, you actually end in either the most recent allowed square you were in, or the closest allowed square (if that’s closer to where you tried to stop). Even if you’re slowed down, you can spend a full round (your move plus your standard action) to move 5 feet (1 square) in any direction, even diagonally. Obviously, this doesn’t let you walk through walls or to a square you couldn’t actually reach (like diagonally around a corner). Basically, unless you’re completely unable to move, your minimum movement for a move action is always 5 feet. You can draw a weapon from its sheath and be ready to fight with it as a move action. You can put a weapon away as a move action. You can use this action for other objects you’re carrying that are in easy reach, like a magic wand, a potion, or a scroll. If the weapon or object is in your backpack or hard to reach, you have to use the Use an Item action. If your attack bonus is +1 or higher, when you use the move action to move, you also can draw a weapon as a free action. Drawing arrows, crossbow bolts, or sling bullets isn’t an action at all—you can do it automatically as part of using your standard action to attack with a bow, crossbow, or sling. USE AN ITEM: Moving or manipulating an item is usually a move action. This includes opening or closing a door, getting something out of your backpack, reloading a light crossbow, knocking over a table or chair, and so on. Mounting or dismounting a horse is a move action. Strapping a shield to your arm to gain its shield bonus to your AC is a move action. Removing a shield you’re wearing is a move action. If your attack bonus is +1 or higher, when you use the move action to move you can also ready or remove a shield as a free action. If you’re carrying a shield in your hand (not wearing it strapped to your armor), you can drop it as a free action. Standing up from a prone position is a move action. A standard action takes up more than half of your turn. Most things your character would do are standard actions. You can use a ranged weapon to attack an enemy as a standard action. The enemy has to be at least 10 feet (2 squares) from you. The maximum range for a thrown weapon is 5 times the range increment listed in the weapon description. For example, a dagger has a range increment of 10 feet, so you can throw it a maximum of 50 feet. The maximum range for bows, crossbows, and slings is 10 times the range increment listed in the weapon description. If you make a ranged attack at an enemy that is adjacent to one of your allies, you take a –4 penalty on your attack roll. If you have the Precise Shot feat, you don’t have this penalty. You can cast one of your prepared spells as a standard action. For more info on casting spells in combat, go to Casting Spells. You can use a magic item like a scroll, potion, or elixir as a standard action. Many magic items work automatically and you don’t have to spend an action to activate them. For example, a magic cloak that helps you sneak, a magic sword that adds to attack rolls and damage, and a magic belt that makes you stronger work all the time. Some class features, like a cleric’s channel energy or an illusion-school wizard’s blinding ray ability, are a standard action. Monsters may have special abilities (like breathing fire) that are a standard action to use. Sometimes the rules say something lasts for “1 round.” That means it ends just before the same initiative number that it started on the previous round. For example, if you cast a sanctuary spell during your turn on initiative 15 and the spell lasts 1 round, it doesn’t end until an instant before your turn starts on initiative 15 of the next round. If the spell lasted 2 rounds, it would end just before your initiative 15 two rounds after you cast it. Just remember that round-based durations always end just before the initiative number they started in. S ometimes t he r ules s ay something takes a “full round” to activate. That means it takes from one initiative number on one turn to that same initiative number on the next turn (like from initiative 15 on round 1 to initiative 15 on round 2). This uses up your turn on the first round, but you still get to take actions on the second round (the “full round” of actions only uses up one round, not two). Whether you’re making a melee attack or a ranged attack, if your total attack roll is equal to or higher than your enemy’s Armor Class, you hit it and get to make a damage roll. All ranged weapons have a range increment, such as “60 feet.” If you attack from that distance or closer, you make your attack roll normally. If you attack from farther away than that, you take an attack roll penalty because it’s harder to hit. You take a –2 penalty for every range increment (or part of a range increment) after the first (closest) range increment. For example, a shortbow’s range increment is 60 feet. You attack normally up to 60 feet away, but from 65–120 feet you have a –2 penalty on your attack, from 125–180 feet you have a –4, and so on. You can’t attack a creature with a ranged weapon unless you are at least 10 feet away from all enemies. You can throw a weapon up to 5 range increments. Bows and crossbows can shoot up to 10 range increments. tree, or another creature. To figure out if you have cover, pick any corner of the square you’re in and draw an imaginary line from you to any corner of your enemy’s square. If this line passes through a solid object or a creature, you get cover against that enemy’s attacks. As long as least one imaginary line from you to the enemy gives you cover, you get cover. Cover gives you a +4 to your AC against that enemy’s attacks. A low obstacle (such as a wall no higher than half your height) may not be enough to give you cover. If your enemy is closer to the obstacle than you are, the obstacle doesn’t give you cover. If you are completely hidden behind a wall or other obstacle, enemies can’t attack you. If every imaginary line you can draw from your corner to the enemy’s corner goes through the cover, you have total cover from that enemy and you can’t attack each other. Charging spends your move action and your standard action. When you charge, you move up to twice your speed and then make one attack at the end of your movement. You must move before your attack, not after. You must move at least 10 feet (2 squares), but not more than double your speed. You must move in a straight line toward one enemy—you don’t have to follow the straight lines of the grid, but you can’t turn when you charge. You must have a clear path toward the opponent, and nothing can hinder your movement (such as difficult terrain). You must move to the closest space from which you can attack the enemy. After moving, you may make a single melee attack against the enemy. You get a +2 bonus on the attack roll and take a –2 penalty to your AC until the start of your next turn. If you roll a 1 on a 1d20, that’s called a natural 1. If you roll a 20 on a d20, that’s called a natural 20. It’s only a natural 1 or natural 20 if that’s what number comes up on the 1d20. For example, if you roll a 19 on the die and you have a +1 bonus, that’s not a “natural” 20. If you roll a natural 20 on an attack roll or saving throw, you automatically succeed. If you roll a natural 1, you automatically fail. For skill checks and ability checks, there is no auto-success on a natural 20 or auto-fail on a natural 1. This means that you can’t automatically succeed at an impossible task (like jumping over the moon) or automatically fail at a trivially easy task (like jumping 1 foot off the ground). If you roll a natural 20 on your attack roll, not only do you automatically hit, but it’s also a critical threat, which means there’s a chance you can turn the attack into a critical hit (or crit) for extra damage. If your attack is a critical threat, make your attack roll again with the same bonuses you had on the original attack roll. If the second attack roll is enough to hit your enemy’s AC, your attack is a critical hit (this is called confirming the critical). If that second attack roll misses, then the attack was just a normal hit and does normal damage. Rolling to confirm a crit doesn’t take any time and doesn’t use any extra actions. Some weapons (like crossbows and longswords) get a critical threat on a natural 19 or 20, not just a natural 20, A rapier or scimitar gets a critical threat on a natural 18, 19, or 20. For these weapons, the extra critical threat numbers aren’t automatic hits like a 20 is. For example, if rolling a 19 + bonuses doesn’t hit, it’s not a critical threat. The “Crit” box for a weapon tells you what number on the d20 is a critical threat. See Critical Hits for information on crit damage. “Other modifiers” may be a +1 from the Dodge feat, a protection from evil spell, or some other defensive bonus. The higher your AC, the harder it is for enemies to hit you. Sometimes you aren’t able to react to an enemy’s attack, like if you’re surprised or paralyzed. This is called being flat-footed. When you’re flat-footed, you don’t get to add your DEX Mod to your AC. However, if your DEX Mod is a negative number, your AC doesn’t change when you’re flat-footed (it’s always bad to have a low DEX Mod). Some special attacks ignore armor and shields—you only need to touch your enemy with the attack for it to work. These are called touch attacks. When you make a touch attack, the enemy doesn’t get to add its armor bonus and shield bonus to its Armor Class, so you have an easier time hitting it. A touch attack is either a melee touch attack or a ranged touch attack, and you add your bonuses like a regular melee or ranged attack. If your attack hits, you deal damage. Your weapon’s damage listing in the Equipment chapter tells you how much damage it does. Damage reduces the enemy’s hit points. When you hit with a melee weapon, thrown weapon, or sling, add your STR Mod to the damage roll. If your STR Mod is a negative number, add it to all weapons except heavy crossbows and light crossbows. If you are wielding a one-handed or two-handed weapon with both hands, you add 1-1/2 times your STR Mod (but only if it’s positive—you don’t multiply a negative STR Mod). If penalties reduce the damage result to less than 1, a hit still deals 1 point of damage. This usually only happens if you have a low STR Mod. If your attack is a critical hit (also called a crit), you deal extra damage. Most weapons have a critical multiplier of ×2, which means a crit deals double damage: roll your damage dice twice and add in your damage bonus twice, as if you had hit your enemy twice. Some weapons have a critical multiplier of ×3, so they do triple damage: roll your damage dice three times and add your damage bonus three times. The “Crit” box for a weapon tells you what the weapon’s crit multiplier is. There are two special kinds of damage that don’t get multiplied if you get a crit. The first kind is rogue sneak attack damage. If you get a critical hit when you make a sneak attack, you add in the extra sneak attack damage only once (not twice for a ×2 crit or three times for a ×3 crit). The other kind of special damage is magical energy damage from special magic weapons like a flaming sword—these weapons add their damage to each attack, but the extra damage is added only once on a critical hit. If you cast a spell that has you make an attack roll, your spell can get a critical threat or critical hit just like a weapon. A spell’s critical threat range is 20 and its damage multiplier is ×2. You’re entirely inside an area that gives concealment (such as a large bush or a cloud of fog). There’s an area between you and the enemy that gives concealment. You’re in dim light and your enemy can’t see well in dim light. Some magical effects give you concealment even if there isn’t anything nearby that makes it harder to see you. Instead of giving you a bonus to your Armor Class, concealment gives your enemies an extra chance to miss you, no matter how good their attack roll is. This is called a concealment miss chance. Multiple sources of concealment don’t add together, you just use the strongest one. Having concealment means the enemy has a 20% chance to miss you. If you have concealment and an enemy attacks you, the enemy has to roll d%. If the attacker rolls 21–100 on its d%, it gets to make its attack roll normally, but if it rolls 01–20, it misses automatically and doesn’t get to make its attack roll. If an enemy can’t see you, such as if the room is completely dark (and the enemy doesn’t have darkvision), the enemy is blinded, or you are invisible, you have total concealment against that enemy. An enemy can’t attack you if you have total concealment against it, but it can attack into the square it thinks you’re in. If it does this, it has a 50% miss chance instead of the normal 20% miss chance from concealment—the enemy rolls d% for its attack, and if it rolls 51–100 on its d%, it gets to make its attack roll normally, but if it rolls 01–50, it misses automatically and doesn’t get to make its attack roll. Concealment isn’t always effective. If you have darkvision, you can see just fine in dim light or darkness. If you have low-light vision, you can see farther with a torch or other light source than can someone without low-light vision. Magic like see invisibility helps you see invisible creatures. A helpless opponent is a creature that is bound, sleeping, paralyzed, unconscious, or otherwise at your mercy. A helpless creature has a –4 penalty to its AC against melee attacks and is treated as if it had a Dexterity of 0 against all attacks (for a total of –9 to AC against melee and –5 to AC against ranged). If you’re a rogue, you get your sneak attack damage against a helpless creature. When your hit points reach 0, you’re disabled and what you can do on your turn is limited. When your hit points reach –1 or lower, you’re unconscious and dying. When your hit points get to a negative number equal to your Constitution score (for example, –10 if your Constitution is 10), you’re dead. See the Injury and Death section (below), for more information about being disabled, dying, or dead.